My latest favorite thing to do is what I affectionately call "blog-stalking." I spent at least 6 months checking out all the amazing craft blogs out there before I decided to join the club.One of my favorites is Tatertots & Jello. (It's creator, Jen, has over 11,000 followers, so clearly she's doing something right.) And one of my favorite things about T&J is their Weekend Wrapup Party, which starts every Friday night. Here's a link to last week's party. If you check it out, prepare to devote several hours days to all the goodness that can be found there (last weekend's party was just shy of 700 links, which I'm still sifting through). Through the link parties, I've discovered many other great & creative crafters, including a brand new one, whose blog title I think is so clever: I Should Be Mopping the Floor - But Instead I'm Pulling Out the Glue Gun. It made me laugh out loud when I read that! Kristi from "Mopping" shared a super cute (and easy, and cheap!) 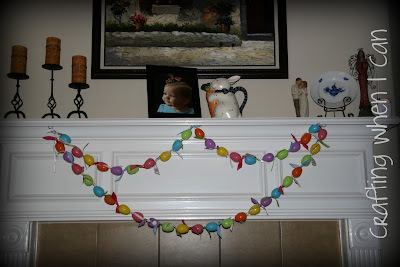 Easter Egg Garland on the T&J link party, and I thought it would be a great way to add a little spring/Easter cheer to my living room. What do you think? Annelise was just a bit captivated by the pretty colors. I already had hooks on the mantel underside that we use for Christmas stockings. Perfect! I wanted to add something else Easter-y to the mantel, so I found this bunny pitcher in the guest room. I think it still needs something more. I saw lots more cute spring ideas on the link party. I just might have to borrow some more inspiration from the blogosphere. I spent about $2 on the eggs at Walmart, and maybe $10 on ribbon (yikes!, but I just can't help myself when it comes to cute ribbon!) I made it today during naptime. 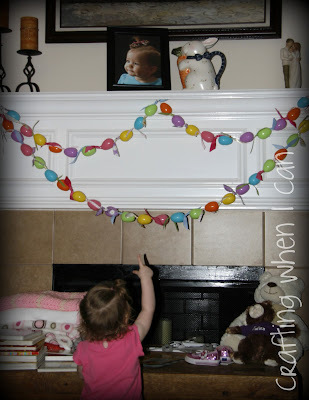 Kristi has a great tutorial on how to make your own garland. You should check it out. Oh fun!! I'm so happy you made this, too! Yours turned out great. I love the photo of your little girl pointing to it...so sweet! My boys always ask if there's treats inside the eggs! 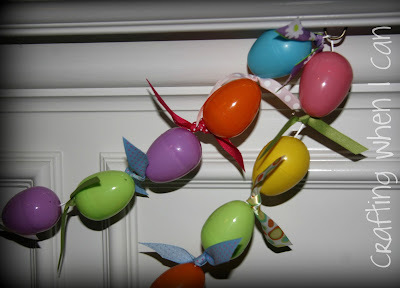 The crafty blog hop is super addictive and way fun. Thank you so much for your sweet words about my blog! Happy Easter Season to you and your family! I also need a good Easter/spring wreath idea. Have you run across any cute tutorials, by chance? Thanks, Kimberly! It was super easy and took about an hour. I got the eggs from Walmart (42 count bag for about $2). 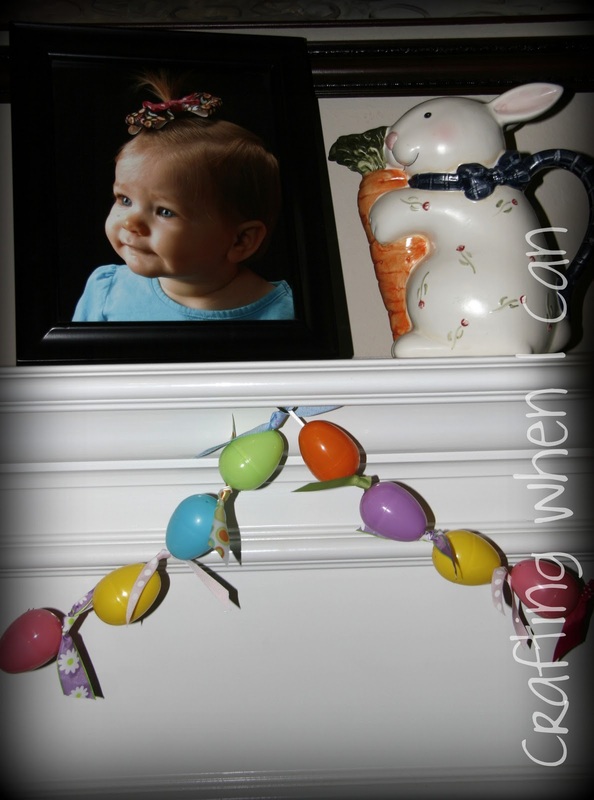 I've seen lots of spring wreaths on Tatertots & Jello (http://tatertotsandjello.blogspot.com/2011/03/great-ideas-spring-wreaths-1.html) - they spotlighted several wreaths from lots of different blogs.